Family, Local History and Heritage Exhibition Stands. See above for a list of exhibitors. 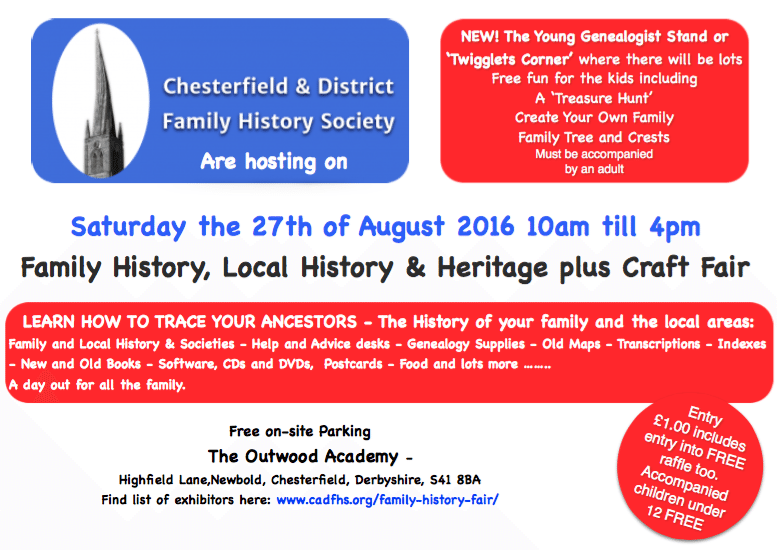 Treasure Hunt, Create Your Family Tree, Crest and more! Eric Chambers’ account of how he retraced his Grandfather’s journey. Local and well known Chesterfield Company, Robinsons & Sons – An excursion to London, taking 3,700 employees. John a descendant of the founders will be taking through this Centenary celebration which took place in 1939 on July 6th; The planning and logistics of such a task. The talk is accompanied by amazing cine footage taken by John’s father, Ernest Robinson, and also footage taken by Gaumont British News which was payed that week at all the Chesterfield Cinemas of the day. Sounds fascinating to me and definitely not one to miss! If you are a Family History, Local History or Heritage Society, we want to hear from you. Are you a crafter? Perhaps even a historical crafter? We want to hear from you too! Click on the button below to book a table at our fair.